Did You Catch the Mars Rover Easter Egg In Today's Google Doodle? The Curiosity landed safely on Mars today, marking a historic day for space exploration. But did you catch the rover in the background of today's Google doodle? We didn't either until a tipster pointed it out to us. Don't feel bad if you're only noticing the rover parachuting over the Olympic stadium just now. 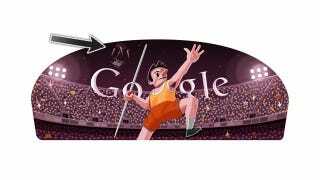 For the last week, Google's been bombarding us with new doodles every day commemorating various Olympic events. You can't be blamed for being desensitized to the doodles by now.